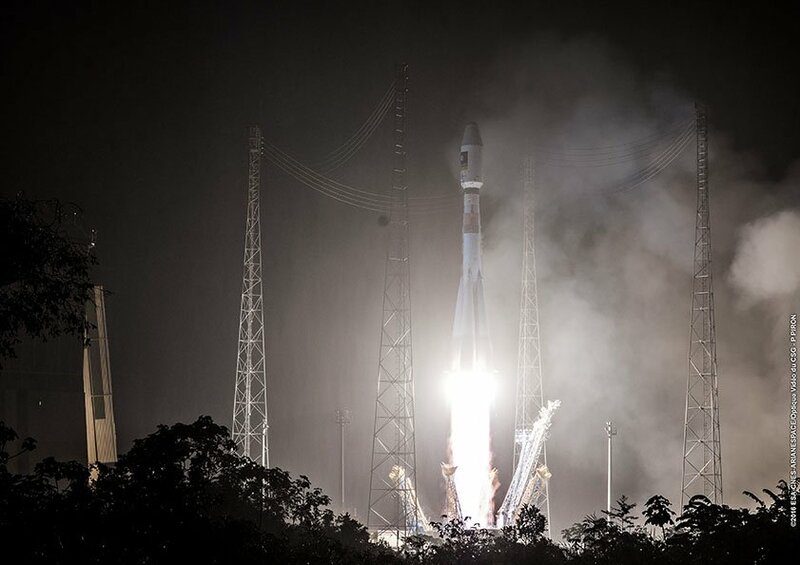 A Soyuz rocket raced into the early morning skies over French Guiana on Tuesday carrying a pair of Galileo satellites into orbit in the continuing deployment of Europe’s Navigation Satellite System that is set to begin initial services by the end of the year. Soyuz lifted off from its equatorial launch pad at 8:48 UTC and delivered rock-solid performance over a nine-and-a-half-minute mission that was followed by a pair of burns by the Fregat upper stage over the course of a flight lasting three hours and 48 minutes. 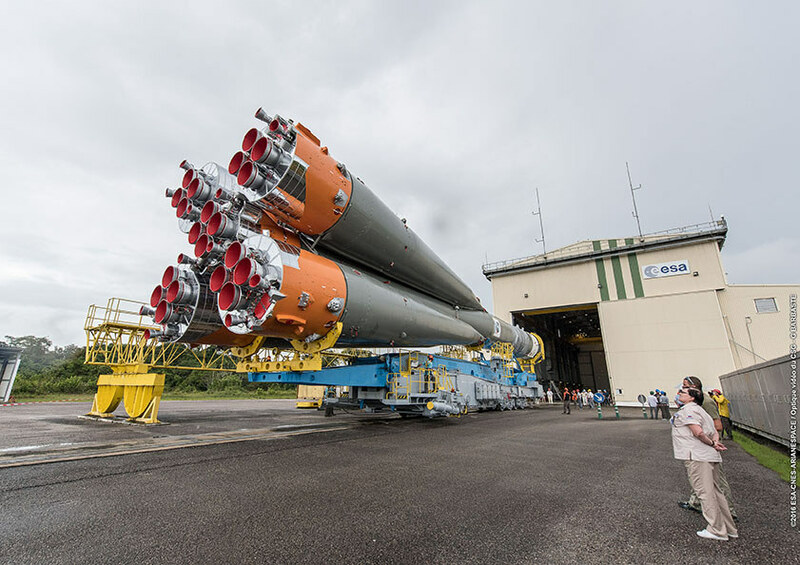 The 15th Soyuz launch from its equatorial launch base was preceded by an uneventful overnight countdown starting in the evening hours on Monday to prepare the launcher, the two satellites and the ground network for the mission. Soyuz was powered up for testing under the watchful eyes of the Russian-European team at the launch site while the two satellites were monitored remotely by teams at the European Space Operations Center in Germany. After a detailed testing campaign, Soyuz was prepared for propellant loading and the two satellites were placed in their launch configuration. Beginning four hours ahead of liftoff, the 46-meter tall Soyuz rocket was loaded with over 275 metric tons of commodities – first and foremost Kerosene fuel and Liquid Oxygen oxidizer that were pumped into the four boosters, Core Stage and Block I third stage. The rocket also received hydrogen peroxide to drive the booster and Core Stage turbopumps as well as nitrogen acting as tank pressurant on the boosters and core and helium serving the same purpose on the third stage. Fully fueled for flight, Soyuz was revealed an hour prior to liftoff when the protective Service Gantry was retracted. Teams evacuated the launch pad and Soyuz headed into its highly choreographed Automated Countdown Sequence at T-6 minutes to check off the final milestones prior to ignition. Flames erupted from the base of the 308-metric-ton launcher as its boosters and core stage engines throttled up to a collective launch thrust of 422 metric-ton-force to lift the Soyuz off the ground. 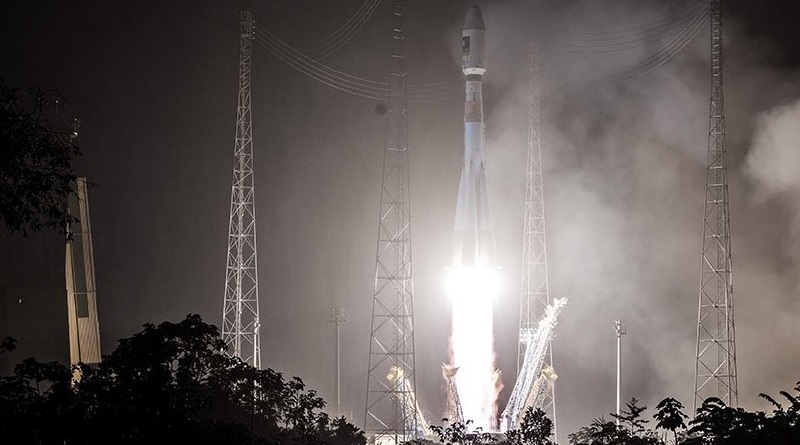 Blastoff occurred at precisely 8:48:43 UTC, 5:48:43 a.m. local time, just half an hour ahead of sunrise. Soyuz disappeared into a low-hanging cloud cover a mere seconds after leaving the ground and remained hidden except for a brief period where its bright engine exhaust was tracked by long-range cameras. Flying to the north-east, Soyuz was approaching the sunrise, burning 1,600 Kilograms of propellant per second. Soyuz shed its four boosters one minute and 58 seconds after launch after each burned 39,600kg of propellant to help accelerate the rocket to 1.5 Kilometers per second. Heading on with less than half its liftoff weight, Soyuz was relying on its four-chamber RD-108A engine that generated a thrust of 102,000 Kilogram-force as Soyuz headed through the rarefied upper atmosphere. The payload fairing was separated three and a half minutes into the flight, revealing the two satellites for the rest of their journey into orbit. Hot-staging occurred four minutes and 47 seconds into the flight when the RD-0124 closed cycle engine of the improved Block I third stage assumed control of the flight. Generating 30 metric-ton-force of thrust, the third stage fired for four and a half minutes to lift the stack into a sub-orbital trajectory. Separation of the Fregat upper stage was confirmed nine and a half minutes after the nighttime liftoff when Soyuz was halfway between South America and Europe on a north-easterly path. 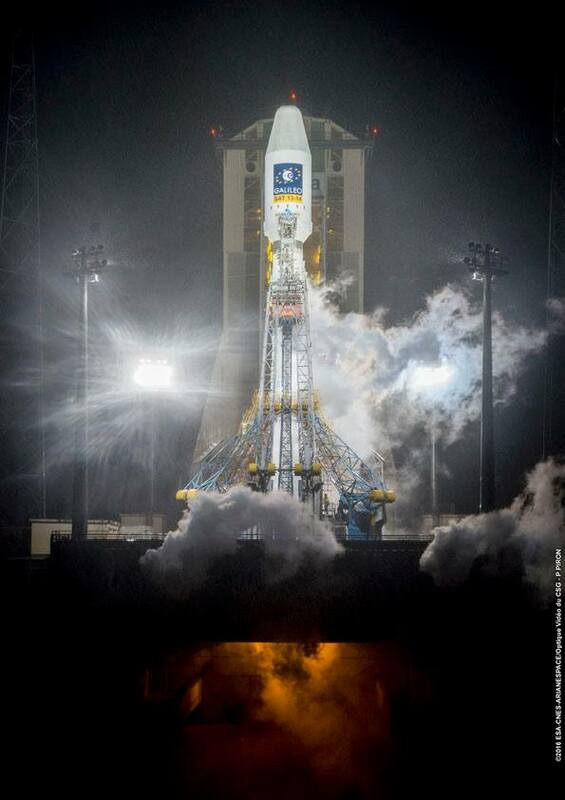 Fregat stabilized its orientation and ignited its S5.92 engine to finish the job of boosting the stack into orbit. Sticking to a standard Medium-Earth-Orbit mission profile, the first burn of the 2,000-Kilogram-force engine targeted an elliptical transfer orbit with a peak at 23,500 Kilometers. After the completion of the 13.5-minute burn, Fregat settled down for a long coast phase of three hours and 15 minutes to climb up to the high point of the orbit for the circularization maneuver. The coast phase took the vehicle over Europe, a portion of Asia and the Indian subcontinent ahead of a long pass over the Indian Ocean. 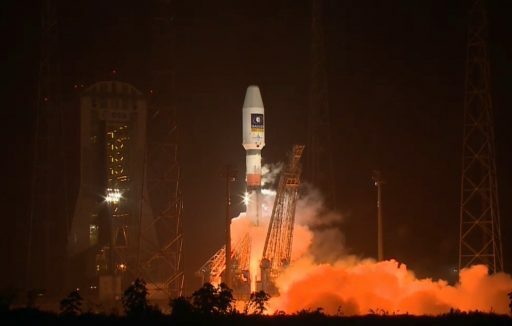 Fregat re-ignited three hours and 38 minutes after launch for a 4.5-minute firing to bring up the perigee altitude, aiming for a circular orbit at 23,522 Kilometers inclined 57.4° from where the two satellites can maneuver into Plane A of the constellation at 23,222 Kilometers. The satellites are launched to a higher orbit where they undergo checkouts and only enter the lower operational orbit once verified to be functional, thus avoiding failed satellites crowding up the neighborhood of the operational constellation. 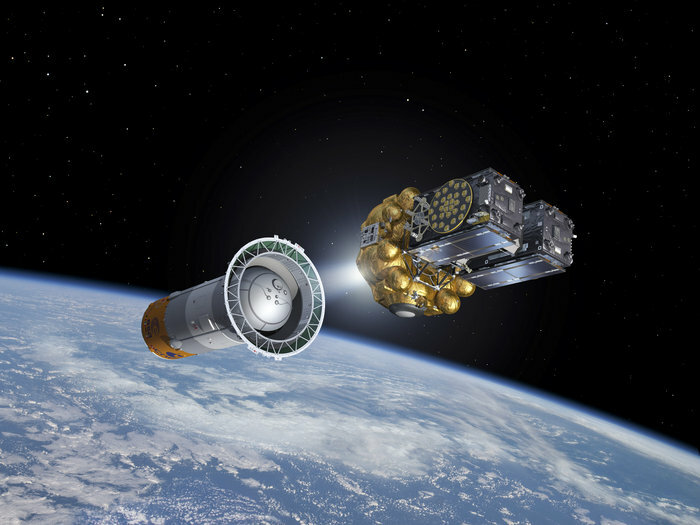 Separation of Galileo FM-10 & 11, ‘Alizee and Daniele’, was completed three hours and 48 minutes into the flight and teams monitored their status for half an hour to verify both were healthy and in their target orbit. 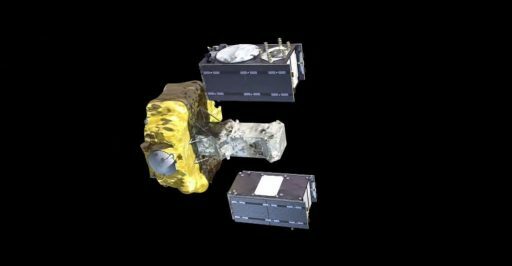 The two satellites successfully deployed their solar arrays and transitioned to a sun-pointed orientation, allowing the team at ESOC to press into a three-day Early Orbit Commissioning Phase. With the VS15 mission a success, Arianespace set a new record for Soyuz launches from French Guiana with only 29 days between this and the previous launch involving the Sentinel-1B satellite – requiring teams to work back-to-back campaigns. For the Galileo program, Tuesday’s launch marked another step closer to the start of services. 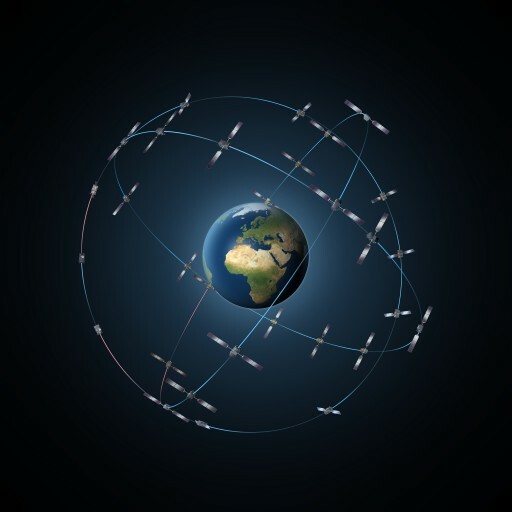 Once the two latest additions are set operational, the constellation will consist of 16 satellites, 15 of which are operational – Galileo FM-3 has a payload power issue and is only broadcasting a portion of available signals; Galileo FM-1 and 2 entered a partially usable orbit after being delivered to an incorrect orbit by Fregat in 2014. The Galileo satellite constellation will provide European nations and their partners with independent and continuous access to global navigation. Because foreign systems like the American Global Positioning System could be shut down in time of crisis, European policy-makers identified the need for an independent navigation system. 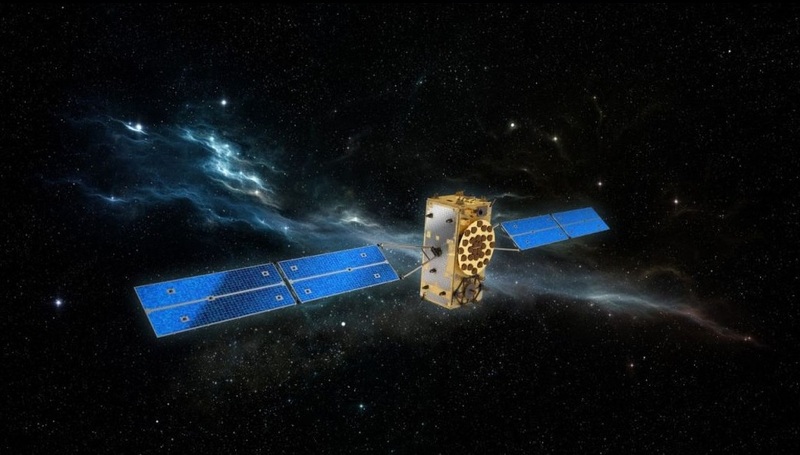 Galileo, ultimately consisting of 30 satellites in three orbital planes, will offer its highest accuracy to paying customers in governments and the private sector while standard services will be free of charge. The satellite constellation will also deliver global search and rescue services. The structure of the Galileo satellite constellation is similar to GPS, offering global services from Medium Earth Orbit. The 715-Kilogram satellites are built by OHB Systems in Germany while their accurate atomic clocks – a combination of Hydrogen Masers and Rubidium Clocks – are supplied by Surrey Satellite Technology, UK. The hydrogen masers were chosen for their high accuracy and very low drift of under 0.45 nanoseconds in half a day while the Rubidium clocks are considered more robust, but exhibit a larger drift of over 1.8 nanoseconds over 12 hours. Galileo operates one hydrogen maser as the primary clock with one Rubidium clock in a hot-backup mode. The next Galileo launch is planned on November 17, upgrading from Soyuz to Ariane 5 to deliver four satellites at once. Flying in its ES configuration with re-startable upper stage, Ariane 5 will use a newly developed dispenser to be able to haul four of the 715-Kilogram satellites to Medium Earth Orbit to fill the last spots in the three orbital planes. Two more quadruplets are set for launch in 2017 and 2018 to bring the constellation to operational strength at which point the launch pace will shift to maintain the constellation in a functional state – ideally with eight active satellites per plane with two spares on standby. For Arianespace, the next mission is on the books for June 8 when Ariane 5 will lift the EchoStar XVII and BRIsat communications satellites. Soyuz is currently facing somewhat of a hiatus at the CSG with no further launches planned in 2016. If no missions are added to the Soyuz manifest in French Guiana, the next mission is likely to occur in 2017 with a batch of OneWeb satellites.